First of all let me state that, as the title says, this is just an introduction to using blues guitar arpeggios and it’s by no means a comprehensive guide (that would require a book or two). My aim is to show how to break out of the pentatonic scale to the ones among you who never used arpeggios, and maybe to give a couple of new ideas to people who already know something about blues arpeggios. Nothing wrong with that, I like this pattern like everyone else, but I like to think of it as a starting point rather than the end of all Blues playing. Ok, the first step in learning how to use the blues arpeggios is to find the arpeggios of the three chords mentioned above (A7, D7, and E7) in a position close to the pentatonic box shape. This way we will be able to transition from the scale to the arpeggio and vice versa with ease. 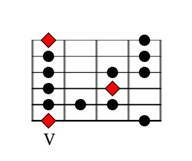 And the blues arpeggios of A7, D7, and E7 close to the pentatonic box. I want you to notice how these arpeggios superimpose PARTIALLY with the minor pentatonic scale. Learn how the arpeggios and the scale relate to each other, how they share some notes and not some other. This will be useful when soloing since you will need to jump back and forth between the scale and the arpeggio. Ok, now that we know the shapes of the blues arpeggios, how do we use them? You can start by playing the arpeggio of the chord in the backing track, i.e. an A or A7 arpeggio when the A chord is playing, then a D or D7 when the D chord is playing, and an E or E7 when the E chord is playing. Of course, this gets old pretty fast since your playing would most likely be fairly predictable if you just play them up and down. In the following I show three simple ways of using arpeggio shapes in a more creative and interesting way. While a phrase like this can have its place, it still sounds more “Shred” rather than “Blues”. Don’t get me wrong, there is nothing bad in shredding, but there have already been lots of articles on how to use sweep arpeggios in shred, and here I’d like to examine a more bluesy and melodic approach to it. The key idea is to play the arpeggios, but not “in order” from the lowest to the highest note or vice versa. You need to “break” them up by playing the arpeggio notes in a different order, and with a different inflection for each note. Most people fail to realize that when they are first learning about arpeggios, so the erroneously conclude that there is no way of using them soulfully in Blues. Now, an example of what I mean here would be very difficult to convey using only tabs, so I prepared for you a video with some examples. I suggest you have a look at it while using the tabs in this article for reference. One of the most important bits of knowledge that you should keep in mind while soloing melodically is this: “The arpeggio shapes contain the strong notes of the chord.” What does that mean? It means that the notes contained in the A7 arpeggio are all going to sound good on the A7 chord, even if you play them isolated (i.e. if you are not playing through all the arpeggio, but only one or two notes). Of course this is just what we have seen in the section above, but there is more to it. It also means that no matter what kind of phrase you play (from an arpeggio, or a scale, or something completely out of whack) the phrase will sound better if you end it on one of the notes of the arpeggio. This is because any tension or dissonance you might have played in your phrase is going to be resolved once you stop on a note of the arpeggio. In other words, you do not have to play the arpeggio shapes at all: you can just remember where the blues guitar arpeggios are located respect to the pentatonic scale so that you are going to end your phrases on a note of the arpeggio. By using the arpeggio shapes as signposts of your solo, you will be sure that you are soloing “in” the chord progression. 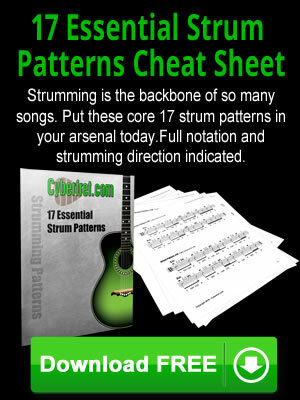 I talk at length about this in my free e-book “melodic guitar improvisation“. One note. I said that any phrase you might play would sound BETTER if you end it on a note of the arpeggio, as opposed to ending it on another note. This, on the other hand, does not mean that you can play the craziest dissonances you can invent and expect them to sound GOOD only because you end them on an arpeggio note. This trick helps, but it’s not the end of the story: taste and experience still play a big part in it. To see these and other licks in action, please see the video guitar lesson. Again, learn how these arpeggios relate to the pentatonic scale. Their use is exactly the same as we described above. The only thing left for you now is to take up your guitar and hear how these arpeggios sound. I can write here at length and it will mean nothing until you have a clear sonic picture in your mind. With a bit of experience you will start to HEAR the arpeggios, and then they will make sense. My only recommendation is that you try these blues arpeggios with a backing track: the whole point of using the blues guitar arpeggios is to be able to play a solo that reflects the chord changes in the blues progression. If you play the arpeggios by themselves then you are missing the most important point. © 2010 Tommaso Zillio – All Rights Reserved. Used by permission.